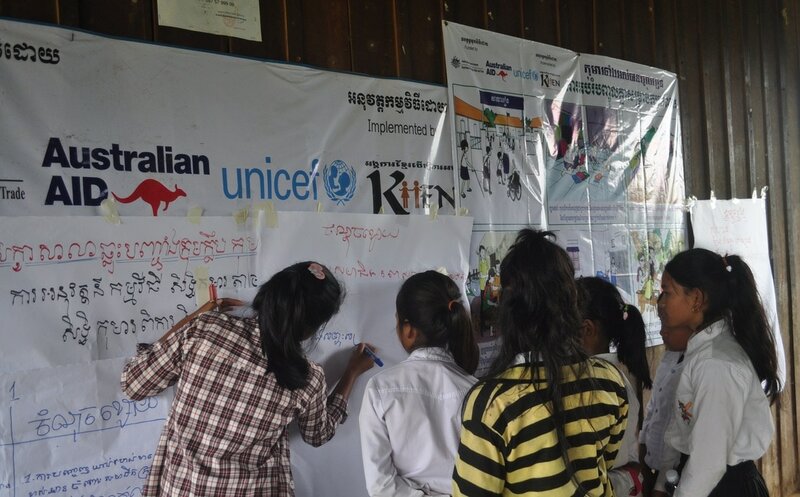 NEW project: "Ensuring Children with disability from remote communities Access to Education" ( July 2018 to Dec 2018)- Funded by Unicef Cambodia. What are PROJECT FOCUS AREAS? KHEN wants to build on the two education projects currently operated.(i.e. Rukhak Kiri project and Samlout Project) and create synergies that will benefit children with disability (CwDs). Improve KHEN’s capacity to work with and for people with disabilities – as a Rights Based organisation. Specific Objective 1 – By end of 2017, identified CwDs in 25 target schools have access to schooling which meets their needs. provided with opportunities, including access to education, which would enable them to fulfil their potential. KHEN work with the Department of Education (DoE), Local Authorities, and Commune Committee for Women and Children (CCWC) to find children with disabilities (CwDs) who are not going to school and give them access to education, and the support and care they need to reach their full potential. Education is not highly valued by these communities. There are a number of reasons for this including: many community members don’t see any benefits of education as they have had little or no education; despite lack of education, community members have still managed to have a livelihood and raise families. Another factor is that Samlot was a stronghold of the Khmer Rouge and Rukhak Kiri has many former Khmer Rouge members. The Khmer Rouge was dismissive of education and aggressive towards those who were educated, i.e. teachers were targeted and killed. KHEN is working in these target communities to see people in these communities to value education for everyone. Despite the Education for All strategy, the Ministry of Education has limited resources to schools and teachers in these districts. This is compounded by the fact that there is also little technical support for the development of curriculum and teacher training manuals for children with intellectual disabilities and receive little support from the Department of Social Affairs, Youth and Rehabilitation – there is only one official in each district to support people with disabilities (PwD). Lack of budget and human resources are the main reasons given for this. School environments which meet the needs of children with disabilities in line with the MoE/Child Friendly dimensions. Assisting in creating school environments which meet the needs of children with disabilities in line with the MOE/Child Friendly dimensions. Incorporate the specific needs of disadvantaged students (poor, disabled, minority, and girls) into the School Development Planning Process by conducting multiple workshops with School Supporting Committees. Capacity development on inclusion and mainstreaming of CwD/PwD (Person with Disability) in the schools, linking to local Child Based Rights groups and the formation of Sub-Committees for Disadvantaged Children (SCDC). Home visits, and special activities within the school. promotion of and support for inclusive education from preschool to high school and informal and vocational education. Collect comprehensive statistics, through the house group mapping and enrollment campaigns, of the nature of disability and the problems the disabled face in the school community. Increased access to disability related services. Source other expertise required to assist with disability issues and to build capacity in a Rights Based Approach for Children and People with Disabilities. networking and synergy approaching for complimentary working. ​Note: this is a list of a few of the key project activities, many more exist.